The most comfortable thing to have in every home is a bean bag chair. It’s essential for both the kids and the adults to work, play, and relax comfortably. With the best bean bag chair, you can sitting or lay down comfortably while enjoying your favorite show on TV. There are many reasons and benefits to have a this comfy chair in your living room or your dorm room. 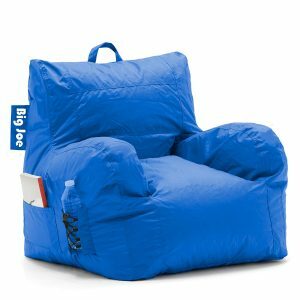 Big Joe is a big name in making the best bean bag chair. The bean ban chair maker uses 80% recycled materials for its environment-friendly products. Thinner than others on this list, the BeanBob bean bag chair is easy to maintain. We really love this Flash Furniture Bean Bag Chair. It’s easy to clean with damp cloth. Filled with the most durable foam, the Sofa Sack bean bag chair is another choice for most people. Have it in your family room, basement or even home theater. Stuffed with a shredded, soft, memory foam, you’ll enjoy flopping and falling on it all you want. It will never lose its shape. The Posh bean bags are best for both an adult and a kid. The cover was made from 100% PVC polyester fabric, making it easy to clean and more durable than other bean bag in this review. Inside the Moonstone Bean Bag Chair is full of shredded memory foam cubes, making comfortable and easy to wash. The Jaxxx 6 is the best bean chair for most adults. The cover was made from lush micro-suede (polyester) and is removable for machine wash. The whole family will love this for its gigantic size. Designed for daily use by kids, grown-ups and even your lovely pets, Lumaland Luxury comes with two separate covers. What makes the CordalRoy’s bean bag chair outstanding from the others on this list is that you can convert it to a bed for sleep over. And it’s easy to do that. It’s the best bean bag chair for a small one-room apartment. Not all bean bags use the same materials. This list of the best bean bag chairs will help you buy the good one at a good price. The bean bag chair cover is crucial when deciding which one to buy. Is it easy to clean or not? Too often, we tend to spill our drink or get the chair dirty unintentionally. That’s why getting the bean bag chair with the best cover is the best choice. The machine washable cover is the best option. At Small Sweet Home, we hand-picked only the high quality, durable products for this list of recommendations.